In 1814 the Russian Navy approached the Montenegrins in the coastline during the Napoleonic Wars. The Russians attempted to impose the Slavic tricolor to the Montenegrins as a national flag with their will for independence, however the Montenegrins refused even to think of it, declaring that they serve only under the cross banner. In the mid 19th century Montenegro (and the Highlands) transformed under Danilo Petrović Njegoš into a secular state. Although he inherited the standard (stag), he used the banner as the state, military and his personal at the same time. Attempts were made to create a flag of the Principality of Montenegro and the Highlands. The first design was supposed to have been the following: three horizontal colored fields with the Montenegrin honored cross in the center. It failed to become what it was supposed to, and instead, the new military stag designed in 1858, just before the Battle of Grahovo, was used in general. The same year though, in April, Danilo had ordered "Pan-Slavic tricolors" to be made in Kotor, to be future Montenegrin flags. The positions of the three stripes (red, blue and white) was changeable and not established fully. Modeled after the many nations that picked national flags after the French Revolution and inspired by the Slavic nations (in particular Russia), Danilo had made his choice and in July of 1860 in Prcanj in front of his and his Princess Darnika's house, he raised high above a "white-blueish-red tricolor". François Lenormant and William Denton described Montenegrin flags in 1865. They compared the Montenegrin national flag to the French, claiming the only difference was it went horizontal. They also recorded that each tribe individually wanted to make thus its own flag. For an example, it is to my personal knowledge that the Grbalj coastal clan had an almost identical flag to that of the Serbian Orthodox Church, a Serb tricolor with four ocilas in the center of it, although the Grbalj were not yet Montenegrin back then. The crucial event was the 1878 Congress of Berlin, when the Principality of Montenegro was recognized as an independent country from the Ottoman Empire. It was internationally recognized under the Serb tricolor (red-blue-white) standard. After the event, this version became permanent and was necessarily found on all state, dynastic and national markings. The Voice of the Montenegrin frequently described how the capital, Cetinje, was entirely swarmed by the Serb tricolors. All administrative and local self-management organs had it flown up in their seats. Throughout the 1880s, in the spirit of national- romanticism that totally engulfed the Montenegrins, the Serb tricolor was massively used by the people on all sorts of occasions as marking of a Serbian national identity. In 1899 the Government explicitly banned the usage of the cross banner on weddings by soldiers, permitting solely the red-blue-white tricolor. On the international scene amongst foreign courts Montenegro become known by this flag, an example being the Almanach de Gotha from 1901, which defined the red-blue-white as Montenegrin national (tri)colors. The red-blue-white colors have become traditionally widespread in the popular military dressing, and Prince Nikola added the tricolor to Montenegrin medals. Sanctioning of the flag had occurred with the brought of the Constitution in 1905. Article 39 says: "The national colors are red, blueish and white." In 1906 the Penal Code for the Principality of Montenegro was enacted. Article 382 banned the usage of the Montenegrin state flag by non- authorized personnel on any occasion save for national festivities, parades, holidays and weddings, and prescribed the penalty of 20 days of prison or 100 crowns. Accordingly, the ordinary Serb tricolor (not with the lightened blue color) remained popular. And even on ordinary occasions, the authorities even at times used it, instead of the constitutionally sanctioned flag. The true origins of the tricolor in Montenegro lie in 1876. Before the wars against the Ottoman Empire that resulted in Montenegro's and Serbia's recognition of independence, there was a unique event on 5 July 1876 on Bobotov Kuk, where Montenegrin flags were sanctified and proclaimed in front of all Montenegrin dukes and chieftains. To be the flag of Montenegro (an independent one), a Serb tricolor with a large coat of arms of Nikola I Petrović on it. This is the only "semi-official" sanctioning, before the Constitution. From it though, do derive the court flags, used by the Court. The following is a description from the Cetinje's"Luca magazine from 1897:v"Heading towards the Monastery, the large Princely Castle raises, in front of which the is the flag with the double-headed eagle, in the center a lion on a green field, surrounded by Serb colors around: red, blue and white." There was also a personal standard of the Monarch. The only difference is that it had a lion underneath the eagle (somewhat traditional to Montenegro back in the old ages) with the "NI" initials in the heart. A little change was during the elevation into a Kingdom in 1910. The Court Flag's only change was that the Crown on the eagle's heads was changed from a Princely to a Regal. The Standard had received a secondary version, not drastically different, the initials were removed from the chest to the place of the lion, which was altogether removed, thus leaving the eagle's chest blank. After 1916 however, in exile, Nikola used primarily an altogether new personal standard: a Serb tricolor with his large initials in the center and a crown on top of them, a bit similar to the Naval ensign. When he died in 1921 his coffin was engulfed in the standard blank Serb tricolor, as per his wishes. It was removed in San Remo in 1989 during the opening of his coffin and his body's return to Montenegro. During the First World War (1916-1918), the tricolors were explicitly banned and the Albanian, Croatian, Hungarian and Austrian flags were the sole ones allowed. The resistance (comitas) used the tricolor though. In the following struggles (1918) during the unification, the Greens used the Serb tricolor. During the Second World War (1941-1944), it would seem that the Montenegrin tricolor would return, but it was almost immediately (within months) banned by the Italian authorities, who allowed solely Nicholas' military banner. This didn't prevent some of the collaborators from using it though, while the Četniks used (next to their black flag with skulls) a Serb tricolor; the Partisans added just a red star in its center, signifying their ideology. A. Ziggioto (Armi e bandiere del Montenegro: molte ombre e poche luci, Archives Héraldiques Suisses [arh], II, 1989) reports four sucessive designs for the civil ensign of Montenegro. This flag is documented in the reconstructions of His Highness Prince Dimitri Romanovich Romanov of Russia (in The orders, medals and history of Montenegro, Copenhagen, 1988). Now the reason why its unofficialness needs to be pointed out is because there was no Montenegrin Navy whatsoever before 1880. It is also worthwhile noting that this is in fact Saint George's Cross. The reason for the choice of the cross lies most probably in the fact that the slava (a typical Serbian Orthodox celebration) of the ruling House of Petrović Njegoš was Saint George's Day. But there is no direct evidence to confirm this Saint George's Cross flag. An image of that ensign is included in the flag plate from the Pierers Konversations-Lexikon, 7th edition, published by W. Spemann between 1888 and 1893. In 1880, the civil ensign was a flag horizontally divided red-white-red with the cross from the war flag set in canton. Although Montenegro was recognized in 1878, full finishing of the act was completed actually in 1880, when the rebellious territories of Plav and Gusinje were returned to Ottoman Turkey, which then recognized the Principality's independence, and also handed over Ulcinj to Montenegro. In 1879 a Commission was formed to draw up a civil ensign for Montenegro. It was the Austrian flag with the Cross-stag (better wording than war flag) to the upper left. The reason for such form most probably lies in the fact that, according to the Congress of Berlin, Montenegro was not allowed to hold warships and its navy had to fall down to the laws of the Cisleithanian crownland of Dalmatia. The reconstruction of the flag by Captain Dinko Franetić shows the flag without Nikola's cypher on the cross. All the other sources agree with that, therefore Ziggioto's reconstruction with the cypher in the cross must be an erroneous interpretation. The cross from the war flag was set in the canton of a tricolour red-blue-white flag in 1880, but this flag did not survived for long either. This flag appears also on a coloured chart kept in the Naval Museum of Kotor. This was very quickly changed by the end of the year; the tricolor being replaced with the Serb one, in accordance to then's ruling ideology - no one really favored a form of formal showing of his sovereign country's subjection to another through national symbols and the Serbian tricolor was widely spread into the Montenegrin society. The reconstruction of the flag by Captain Dinko Franetić shows the flag without Nikola's cypher on the cross. All the other sources agree with that, therefore Ziggioto's reconstruction with the cypher in the cross must bean erroneous interpretation. McCandless and Grosvenor's Flags of the World (1917) [gmc17a] claims that a tricolore red-blue-white flag charged in the middle with the red cypher Н I surmounted by a yellow crown was the war ensign while the civil ensign was the plain tricolour. However, it is very doubtful that Montenegro then had a war fleet. This flag appears also on a coloured chart kept in the Naval Museum of Kotor. The Encyclopedia of Flags [zna99] says: "In 1880 Montenegro adopted a merchant ensign, a tricolor similar to that of Serbia with a white cross in the center (sic) of the red stripe. A year later the cross had been removed, and a crown with the royal cypher Н.I., for Nikola I, placed in the center". In 1852, Montenegro was transformed by Prince Danilo Petrović Njegoš into a secular state (a Principality); he had forfeited the seat as the head of the Cetinje Metropolitanate, leaving that to the Church in favor of the seat of a secular monarch. The very first banner Danilo had was the one with origins (inherited) from the theocratic state that had existed before the secularization. It was a red flag with a yellow border and the cross inside - the "Cross banner" as it was very well known. Prince Danilo made a tiny amendment to the flag, adding his golden cypher Д. I. in the cross' center. Danilo I made serious reforms in an attempt to formalize his realm into a real state, including strict martial units. Hence, this flag became the battle stag of the basic Montenegrin battle force - the Centurian unit (100 men) known simple as "Company". It subsequently split into "Decades" (10 men), but they had no insignia or self-command. The greatest Montenegrin unit was called "Guard", composed out of 1,000 men. This created a need to invent new banners for them. For this purpose, the cross on the banner was replaced by the Montenegrin coat of arms - the double-headed white eagle. Golden initials were also added to its center, but the flag had no border at all, unlike the Cross banner. It became henceforth known as the Alaj-barjak. The final needed thing was to create a common Supreme HQ War Flag for Montenegro. It was the "full alaj- banner", designed right before the 1858 Battle of Grahovo. The only addition to it was the last missing element of Montenegrin heraldry, the lion, which was put directly beneath the eagle. This same flag was temporarily used by the first state organs while a national flag was being looked for (a tricolor) and designed. In 1860 Danilo was assassinated and he was succeeded by his nephew Nikola, rather than Mirko who forfeited the right to successorship. The only significant change that we could guess is that the initials of his predecessor were removed. The reason to conclude that is a Centurian (cross-)banner from the wars against Omar Pasha in 1862, which is identical to the previous, except that it bears no initials in its center. However, the Montenegrin Army was reformed by a Decree in 1871, in a conservative manner. A Company was composed out of men a settlement could give. Its banner only rarely had Nikola's initials on the cross. The next unit was a Battalion. It was made by soldiers from a single clan. The Battalion's banner was identical to Danilo's, save for the fact that on it were Nikola's initials (Н. I.) and that it had also a white border around (a yellow border was never used). The last and largest unit was a Brigade, made by able-bodied men from an entire tribe and probably commanded by the elders themselves. The only difference in the flag was that it was of better quality and materials when compared to the battalion's stag. Prince (and later King) Nikola I Petrović had a Supreme War Flag, with only stylist differences: it had no border, the eagle's beaks and legs were more closed, the element in its left paw was not blue but all-golden; the flag was also on a special sharp spear that was all in Montenegrin national colours: red, light blue and white. These War flags were used occasionally on State celebrations and during family rituals, including marriages and funerals. Therefore, special martial laws forbade the usage of these new flags in any other manner. These stabilized battle flags were used until the end of the old Montenegrin state with the events the First World War brought (1916 & 1918). During the Second World War (1941-1944), Nikola's personal Supreme stag was used as the exclusive flag of the Axis puppet-state Montenegro, after the tricolor was banned. One of especially valuable exhibits kept in the Historical Museum of Montenegro is a famous flag from Vučji Do. This warriors' flag, riddled with shots, symbolises a heroic struggle and victory of the Montenegrins in one of the last battles for liberation (1876), which preceded the recognition of independence of Montenegro at the Congress of Berlin in 1878. As a symbol of freedom the flag waved at Montenegrin Pavilion, at the Balkans exhibition in London in 1910. 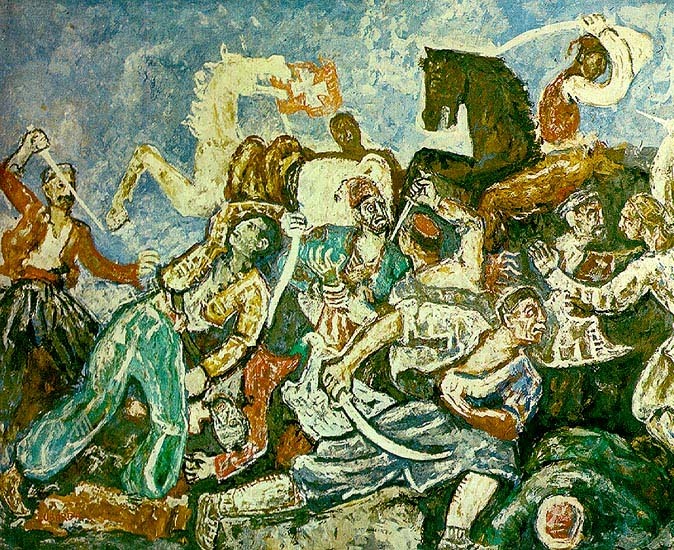 The Vučji Do flag is represented on the painting "The battle of Vučji Do", by the famous Montenegrin painter (of the Socialist Yugoslavia, but modernist) Petar Lubarda (1907-1974). The history of the state coat of arms begins with the Crnojević's dynasty in 15th century. Their family arms, "Gules a crowned double-headed eagle or", laid the foundation of the Montenegrin state heraldry: the double-headed eagle became the standard symbol of the state. After gaining the power, the Petrović Njegoš dynasty took the golden double-headed eagle as the state symbol. Prince Danilo (1852-1860) also reorganized the coat of arms: he charged the golden eagle's breast with the shield where on the blue background the golden lion passant was on green ground. In one claw the eagle held the saru, and in the other a sword and the scepter. The coat of arms was therefore "Gules a double headedeagle displayed or crowned with one crown proper holding in dexter claw a sword and a sceptre and in sinister the orb, and on escutcheon azure a lion passant or on a mount vert". In the time of Prince (1860) then King (1910-1917) Nikola, the sword was removed and later, in conformity with the Constitution of 1905, the color of the eagle was changed from golden to silver (but see below), as well as the colour of the background of the shield with the lion, to red instead of blue. It is incorrect to say that Nikola changed the double-headed eagle from gold to silver. This rumor has spread greatly across several internet sources, but is really completely false. Throughout Nikola's reign (1860-1916) the eagle was white. In the very first official Montenegrin annual, Orlic, edited by the poet Jovan Sundeči, from 1866, there is a description of the eagle as "white". In 1877, one of the greatest foreign researchers of Montenegro, the Czech Joseph Holeczech, wrote in his study Montenegro: "The coat of arms looks this way: on a red field the double-headed white eagle...". The French historian François Lenormant published in 1869 in Paris his study Turcs et Monténégrins, in which he describes the Montenegrins' coat of arms as "white". Most important, the Principality of Montenegro was in 1878/80 recognized as an independent country under that very same white eagle. The coat of arms of the medieval Crnojević dynasty was indeed charged with a gold eagle - or at least, it is depicted as such in the "Illyrian armorials", a series of apocryphal armorials created from the 15th to to the 19th centuries, which do contain a lot of completely fictional blazons, but also a number of those which can be verified by other sources, although the tinctures, as in this case, are generally not verifiable and are reconstructed after the "Illyrian" images. On the other hand, the rulers from the Petrović-Njegoš dynasty, neither the Princes-Bishops, nor later Princes, were never using a gold eagle in the coat of arms of the country. However, in the 19th century, a series of insignia for various state dignitaries were introduced, which were called grbovi ("coats of arms"). These were badges meant to be worn on the caps that were in everyday use at the time and still make an important part of Montenegrin folk costume. They consisted of an eagle above a lion, sometimes with other charges like crossed sabres, but both heraldic animals, as well as the additional charges if they existed, were always either gold or silver, the choice of metal depending on the title of the user. It is quite possible that these "coats of arms", the name of which does not fit the best into the present use of the term, were the source of this confusion, by someone's neglect of the fact that silver and gold variants have existed together. The shield with the lion, said to have been changed from blue to red in 1905, has actually varied a lot before that date: all red, red with green base, red with silver/white base, blue with green base, examples of all these being preserved until today. What was done in 1905 was only the standardization, fixing the shield with all-red field as the official version. The coat of arms of 1905 is shown, among other things, on banknotes issued in Montenegro until the First World War (photo, photo).